Article by Jan Leonard…thank you Jan! In the ten year period between the two censuses the three oldest daughters, Margaret (Aunt Millie). Mary Emma (Aunt Em) and Jane Ann (Aunt Ann) had all married. William and Jane (Jeanne) were on the move too; the 1895 enumeration finds them in Moran Township near Browerville in Todd County. In that time they had three more children, daughters Kathleen, 10 whose name is misspelled as Catherine, Edith who is six, and Ruth, four years of age. Married daughter, Jane Ann (Walker) Upper and her husband are living with them or right next door. In this record the enumerator made a spectacular “hash” of Aunt Ann’s husband’s name. 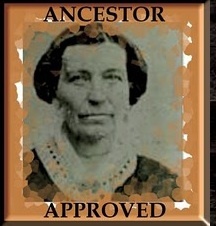 Osborn Upper, is listed as Ruper Osborne and thus Aunt Ann is temporarily Anna Osborne! This census also asks how long males over 21 years of age have been in the State and in the Enumeration District. William and son George are recorded as have been in Minnesota for 17 years which corresponds to Olive M. Walker’s birth year 1878. They had lived in Moran Township for a year. In addition to bringing Eunice Walker to light, these two state censuses taken together have also raised questions about where the Walkers lived between the time they homesteaded in Bluffton Township in Otter Tail County and when they moved to Bemidji, MN More research is needed. This article was donated by cousin Jan Leonard. Thank you Jan for this interesting post which raises some new questions about the Walker family. I hope all our readers will enjoy this family mystery. Those of us researching Walker family history are at least three generations removed from William Alexander Walker and his bride, Jeanne Arbuckle. We often lament the questions we didn’t ask our parents or grandparents, the unlabeled photographs found in their belongings and the phantom letters we wished they’d left. Many of us have childhood memories of or had heard stories about then Walker children; Aunt Ol, Aunt Em, Aunt Cal, Aunt Babe, Uncle Bill, Aunt Ruth and the rest. We thought there were twelve Walker children. However the Minnesota State Census enumeration lists Eunice A. Walker, 9 months old, among the Walker siblings living with parents, William and Jane (Jeanne). 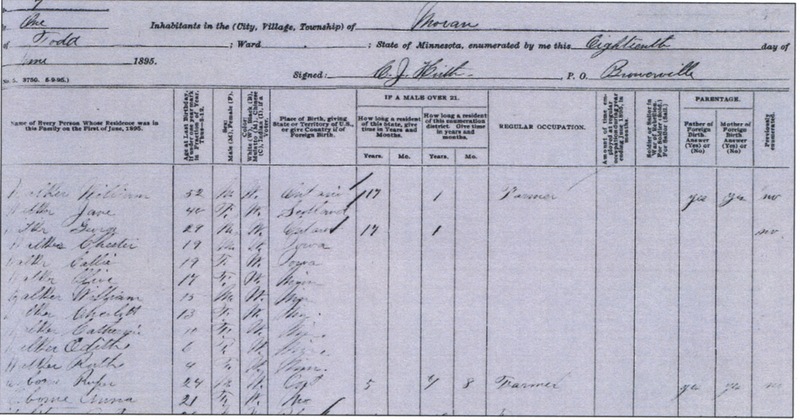 This census was completed on May 23, 1885 in Compton, Otter Tail County. All of the siblings we expected to see listed for this date are enumerated except possibly Kathleen (Aunt Babe). Kathleen’s year of birth has been documented as either 1883 (the Social Security Death Index) or 1885 (the Minnesota State Death Index). I was puzzled at finding Eunice because there are family stories or documentary evidence for all the other Walker siblings but none for Eunice. Because of the uncertainty of Kathleen’s birth year I also wondered if this child somehow might be Kathleen. I reviewed all the census data for Kathleen Walker and the weight of the evidence is that she was born in 1885 so I eliminated the possibility that she was the mysterious Eunice. If the Walker family is correctly enumerated in the 1885 census is then William and Jeanne had thirteen children (of which we know). Copyright Janice Leonard, February, 2015, All rights reserved. A San Francisco cable car holds 60 people. This blog was viewed about 2,200 times in 2013. If it were a cable car, it would take about 37 trips to carry that many people. 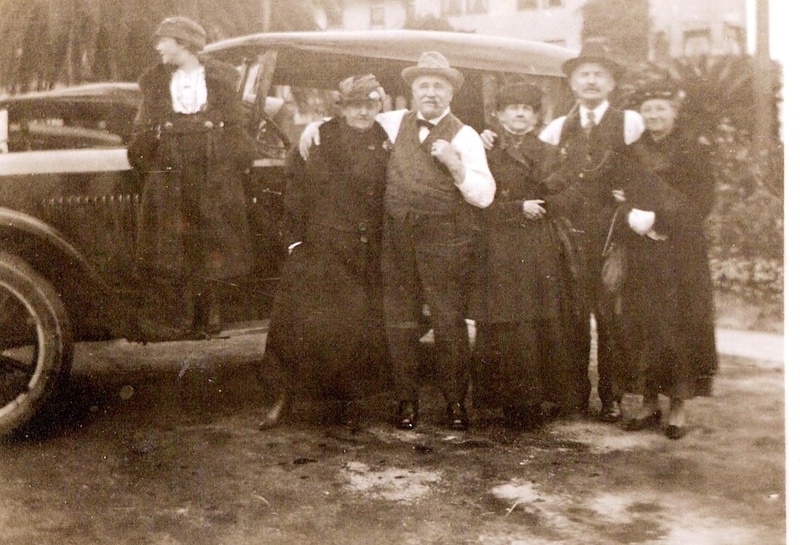 Among the items a family leaves behind are often a group of unidentified pictures, right? I spend a lot of time sitting here scratching my head, looking at faces to see who the person resembles, checking their hair style and clothing to try to figure out when the picture was taken, and on and on. Creeping frustration sets in, but then I recall all the times I’ve neglected to identify my own family pictures. Naughty girl! So without complaint I present four pictures that have no identification and for goodness sake if you know who the people are would you let me know so I can stop agonizing over them? (Just joking) Thanks in advance. 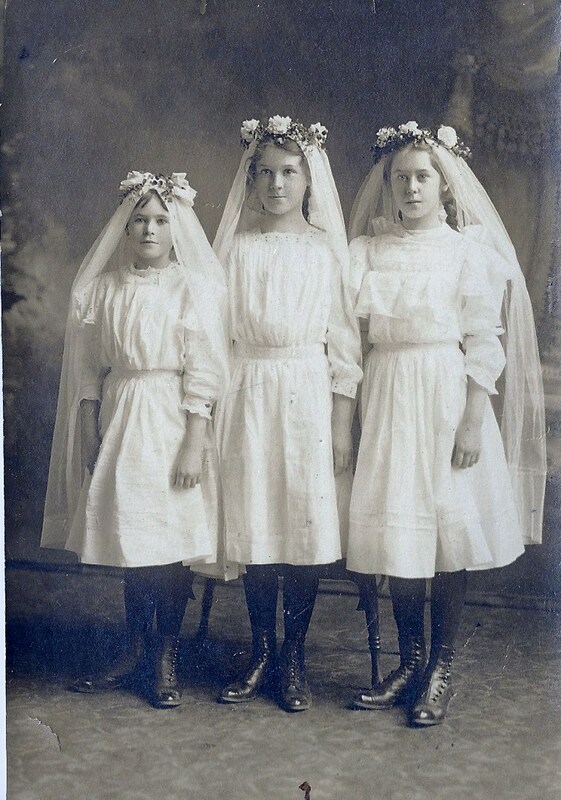 These lovely young ladies seem to be dressed for a special occasion, probably their First Communion. Similar pictures in a photo dating book puts this type of dress around 1900-1904. The two girls at the right strongly resemble another picture titled Mary and Josephine. Could that be who they are, or could they be daughters of Mary or Josephine or other Samels women? I’ve no guesses as to who the girl to the left might be. 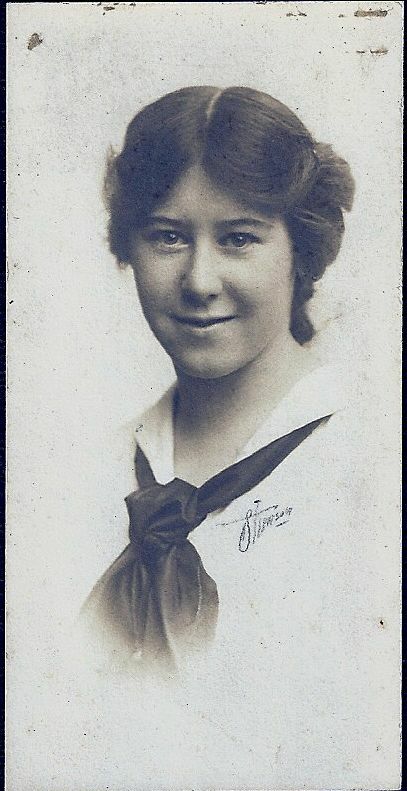 This sweet looking young lady is wearing a kind of sailor blouse. Could be a school uniform, but this style of garment was popular around 1910 give or take. Her hair style looks even later. To me her smile is reminiscent of the Samels family, but that’s just a guess. This neat picture is a prosperous looking family out enjoying a spin in their new car. The gentleman in the back row right is Will Samels. The rest? This happy group seem to be out for a picnic or at least enjoying a nice sunny day. 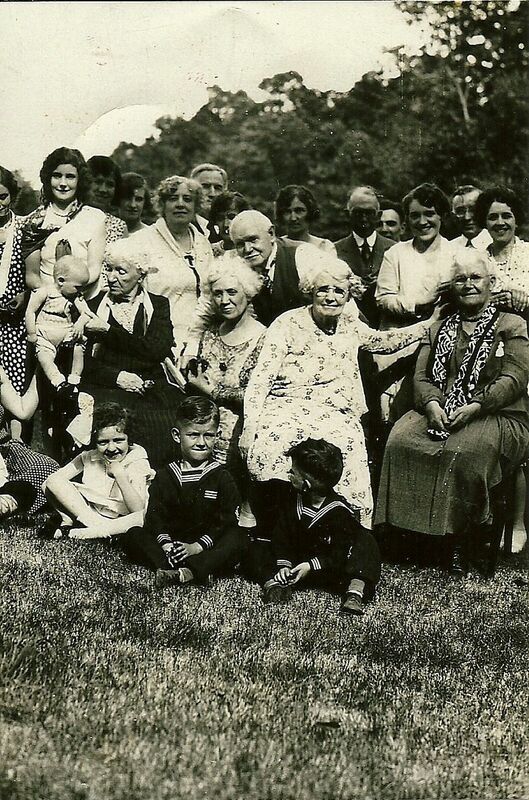 It’s more modern than some of the other pictures and the children in front are June Taylor and her twin brothers Ernest and William. June was born in 1922 and the twins in 1924 so as a guess this picture may have been taken around 1930? ********************************************************************************So there you have it….lovely pictures just looking for identities. Photographs used with permission of the owners. I’ve added a gallery slide show of Samels pictures in my collection. Special thanks to my Minnesota cousins, Pat, Loretta and Marie for sharing their Samels family photographs. Some pictures are a bit fuzzy and I apologize where the rendering isn’t as clear as I’d like. I’ve recently undertaken a clean-up, re-organize and re-write for my blogs …oh my… it’s taking awhile. But yesterday I did finish a re-write of my parents story: Frank and Jean Shane, A Love Story and have posted it on Vimeo. The new version features more pictures and additional data as well (birth dates, etc). To see this 6 1/2 minute “show” click the link! I hope you enjoy it. or are used with permission of the owners. 600 people reached the top of Mt. Everest in 2012. This blog got about 4,100 views in 2012. If every person who reached the top of Mt. Everest viewed this blog, it would have taken 7 years to get that many views.